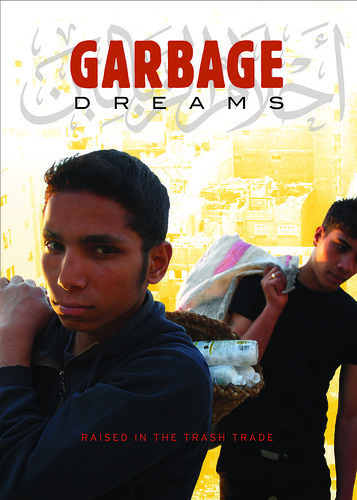 Last night I had the opportunity to attend a screening of the award-winning Garbage Dreams documentary about the Zaballeen (Arabic for "garbage people") who live on the outskirts of Cairo, Egypt and make their living off of recycling the city's trash. You can view the trailer here. It is a very well directed non-narrated documentary that tells a compelling story of three teenage boys and how the entire Zaballeen community has been disrupted by recent government contracts with foreign waste management companies. Ironically, the story is told with an allure of fresh air and light hearted undertones that really draws the audience in and allows them to connect with the Zaballeen. The spiritual steadfastness of the faithful Coptic people is also uniquely expressed via their optimism and determination as they attempt to take on their new contenders. Although I won't go as far as saying this is a life-changing, eye-opening documentary there were a few scenes that really caused one to ponder. Apart from the constant optimism and gratefulness towards God expressed throughout the documentary, one incident in particular really hit home. The scene was of Osama, one of the Zaballeen teenagers, folding his tonya (altar boy garment). He had folded it with such treasured attentiveness that it immediately had my friend and I thinking about how we take such things for granted. It was a simple, short scene, but one which helped characterize the entire film in my eyes. (Pictured at left, Zaballeen Recycling School). Below are some shots I took with my phone after the viewing, please excuse the quality. 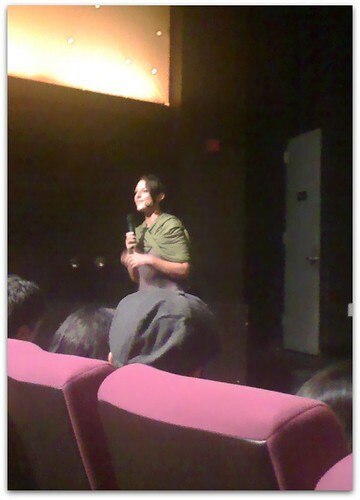 Director Mai Iskander during a brief Q&A session following the screening. H.G. Bishop David and Director Mai Iskander exchanging contact information after the film. This movie was great and sold out in NYC! SUPPORT THE ZABBALEEN AND COME SEE THIS MOVIE!! ATTEND THE OPENING NIGHT IN LOS ANGELES AT THE ARCLIGHT THEATER ON AUGUST 14TH AT 7:45 PM. for many it is an eye and heart opener... the film portrayed the zaballeen and their plight in a very human and dignified manner. their faith is inspiring. they share the same uncertainties and the same dreams we have here in the USA. we take so much for granted... many people have misconceptions about the zaballeen that i hope this film cleared up. thank you to mai iskander for doing such an awesome job! may god use this film for the glory of his name and for the aid of his 40,000 plus coptic zaballen. This film moved me to tears. It is almost impossible to watch this globally relevant movie and not feel compelled to act in some way to help promote, publicize and celebrate these vibrant, determined and innovative this Coptic community of garbage workers. THE ZABBALEEN DREAMS ARE OUR DREAMS, AND THEIR FIGHT FOR SURVIVAL SHOULD BE OUR FIGHT FOR SURVIVAL SHOULD BE OUR FIGHT AS WELL.